Home / Blog / Books / Sneak Peak! 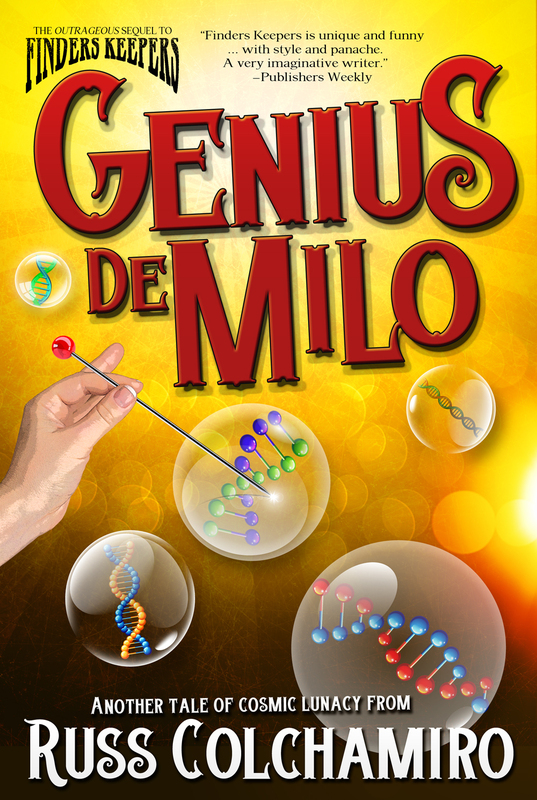 First Chapter of Genius de Milo — FREE! Sneak Peak! First Chapter of Genius de Milo — FREE! Thanks so much for all of the enthusiastic support for my latest novel, the sci-fi comedy Genius de Milo! If you like what I’m putting down — and by your responses, you are! — then here’s a chance to check out the first chapter — for free! How can you beat a deal like that?! It began with a flicker. Eternity, yes, of course, because that’s where all of Creation originates, where even just a single idea, a notion—a tickle in the back of the brain—alerts you to the possibility that something is brewing. Something delicious. Strange. Alluring. You’re not quite sure what that glimmer might be—that flicker, that tickle—but whatever shape and form it takes, whatever it eventually becomes, well, you know you’re onto something. But this was a different kind of flicker. As the Minder of the Universe—the presence overseeing the Cosmos—it was Brigsby’s job to notice these kinds of things. Yet as the host of Breakfast with Brigsby, the top-rated talk show in Eternity, Brigsby was an entertainer to the masses, hidden in plain sight. He needed to interact with Eternitarians at least enough so that he could gauge their response to his grander endeavors, but even the good folks of Eternity weren’t ready to know just who and what he really was. So talking to them through their TV sets about food, fashion, and relationships made it a heckuva lot easier to conceal the fact that he was also responsible for the creation of the Universe and everything in it. When entertaining guests, Brigsby drank blue martinis, always a blue martini. But when he needed to unwind, nothing did the trick like sitting on his couch, in a silk bathrobe, with a snifter of chocolate milk. His slippered feet rested on the coffee table. Brigsby may have had power and influence beyond the scope of comprehension, but his appearance was that of a frail, wrinkled, middle-aged man who could be easily floored by the flap of a butterfly’s fart. He shuffled in his seat so that his chocolate milk sloshed within the snifter, peaking over the lip, spilling into his lap. Lawrence let out a wry smile. Not only did he serve as Executive Manager of the CBM Warehouse—the storage facility securing Cosmic Building Material, the Universe’s liquid DNA, the building blocks of all Creation—he was also Brigsby’s personal attaché. As such, he gave Brigsby the business now and then just to keep him honest, Minder of the Universe or not. Lawrence stared into the great expanse. Of the countless celestial bodies in the Universe, Brigsby had taken a special liking to Earth. When he commissioned the planet’s creation, he had it written into the design blueprints that the inhabitants be fashioned with the innate ability to evolve into beings far greater than their consciousness would allow them to initially perceive. If they were to ever reach their true potential, Earthlings would need to survive their own self-destructive impulses long enough to strip away their ego and realize that their very existence was only the first step toward a much grander design. On the surface Lawrence had asked a seemingly straightforward question. But as applied to the standards of Eternity, time was not a simple conceit. The passage of time could speed up or slow down. It could leap ahead or jump back. It could travel in loops. It could bend (but not break). It could twist, flatten, knot and gyrate, as well as oscillate, pendulate, undulate and rotate. It could also whirl, purl, revolve, slant, spin, expand and retract, and—when it really got going—whiz, shimmy, shake, buckle, tangle, tremble, tread, roll, flip (although not flop) and even completely reconfigure. And it could all happen simultaneously or in any combination. Though the fate of Existence was summarily at his whim, Milo was one irritant Brigsby could, at best, contain, and then only for short durations. Even Brigsby didn’t know how or why he himself was the Minder of the Universe, where that power ultimately came from, or what fibrous tissue ran through the grand Consciousness. He had always been and, as far as he knew, would always be. Until his time was up. And until that occasion presented itself, Milo would remain his eternal foil. The Jester to his ultimate court.